With the advent of the World Wide Web, the world has become more interconnected than any time before. Not only has the internet given people access to a mind-boggling number of services from all over the world, but it has also acted as a platform allowing different individuals to do all sorts of different things, from launching a business to starting a blog that acts as an outlet for their creativity. With all that being said, anyone who wishes to launch a website, be it your neighbor from across the hall to Mark Zuckerberg back when he was still starting Facebook, needs to do two things: find a good web hosting service provider and register the name of their website with a good domain name registrar. Whereas finding a web hosting service provider is outside the scope of this article, this article will cover everything you need to know about domain name registrars. We will start by understanding what a domain name registrar is and what qualities you should look for in one. Subsequently, we will take a look at the things you should watch out for before we dive into a detailed comparison between some of the best registrars out there. Finally, we will end the article by discussing a few tips that might come in handy as you build your website and then do a quick recap. Before trying to understand what a domain name registrar does, you should understand what a domain name is. In a nutshell, a domain name is the name of the website you type into your address bar when you want to visit that site. For example, if you want to check your latest social media updates, you probably write into the address bar of your browser the name of that social media site, such as Facebook.com or Instagram.com. With that said, it must be said that domain names make all our lives easier. You see, without domain names, we would all have to write long, complicated IP addresses in the address bar every time we wanted to visit a site instead, which would be very hard and quite impractical. Obviously, for a domain name to be fully useful, it needs to be unique and to lead to a single site only; otherwise, there will be no way for your browser to know what site you wanted to go to whenever you typed amazon.com in the address bar. Now that we’ve briefly covered domain names, understanding what registrars do is just one extra step. Simply put, registrars offer people the service of purchasing and registering domain names for their sites. They also allow you to choose your website’s URL extension, be it .com, .org, or any other extension out there. Once you purchase your domain name along with the extension, the registrar stores it in a domain name record in a centralized database, called the registry. Registrars also add other relevant information when storing your domain name, including who owns the site, when it was started, and so on. So, can any company become a registrar? The short answer is yes. However, it is always better if a company gets accredited by the Internet Corporation for Assigned Names and Numbers, ICANN for short. The ICANN is a non-profit organization whose purpose is to manage domain names and allow companies to add and modify names on the registry. Seeing as how we now understand what a domain name registrar is and what it does, we can start thinking about what criteria should be kept in mind when shopping for one. What are the things you should look out for? Beware of registrars who will suddenly add on extra fees just as you are about to buy a domain name. This is done especially when the registrar lures you in with an extremely cheap price, only to surprise you with a different actual price as you are about to finalize the sale, leading you to pay way more than you had expected. Registrars do this in one of two ways: They either give you the first year of registration for a cheap price in return for raising the prices during the following years. Or, they might try to upsell you, offering you things you don’t need. They do this by checking a lot of the boxes on your check out page, and unless you personally uncheck these boxes, you will end up paying for a lot of services, plenty of which you never asked for nor will you ever need. Alternatively, other domain name registrars are simple: What you see is what you get. The price they advertise is the one they give you. When setting up your website, particularly if you’re doing it on your own, you’ll need your registrar to offer you a useable domain management system. Otherwise, the whole experience could be unpleasant and needlessly arduous. So, you should avoid any registrars that are not user-friendly, which is something you can find by exploring the reviews of different registrars. Having seen what criteria we should keep in mind as well as the things we should be wary of, we can now take a look at some of the best registrars out there. To make matters easy, we will look at a quick introduction into each registrar before looking at how it stacks against the criteria mentioned above. 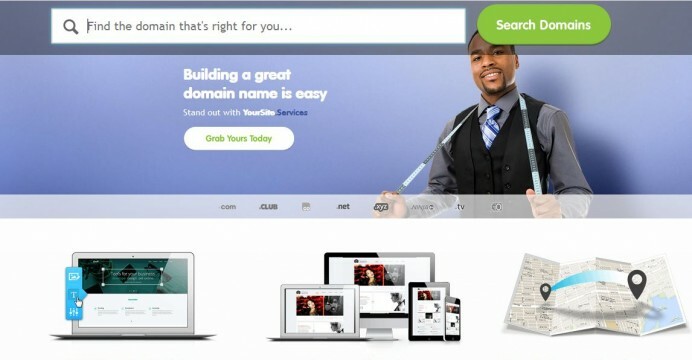 Which are the Best Domain Registrars? Domain.com was established in 2000, and since then it has managed to become one of the most popular registrars in the market. In fact, their market share is approximately 0.7 percent, which translates to about 2.4 million registered domain names so far. Additionally, they offer both top level domain name extensions, i.e. .coms and .orgs, along with more country code top-level domains. They are an ICANN accredited company. One of the factors that affect their pricing is the domain name extension you want to buy. For example, a .com extension will cost you $9.99 a year, whereas a .net or a .club will have you paying $10.99 a year. Also, a .co goes for about $11.99, but both a .org and a .xyz are sold for $14.99. Their customer support is helpful and accessible through live chat or email. They offer a multitude of other services, including SSL certificates for $31.99 a year, Google’s G Suite for $4.17 per month, WordPress hosting for $3.75 per month, and VPS (which stands for a Virtual Private Server) for $29.70 per month. Domain transfers are easy with Domain.com. Their domain management tools are all top-notch, the sort of tools you come to expect from top of the line registrars. 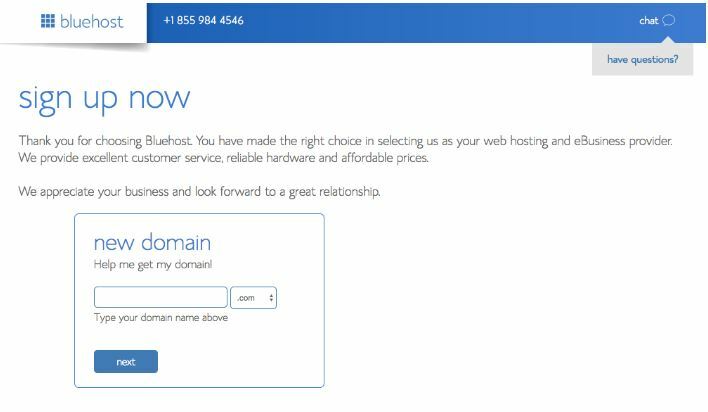 Known more as one of the most well-known affordable web hosts in the market than as a domain registrar, Bluehost is an excellent place for people just starting out. Nevertheless, to facilitate their web hosting experience, they also do offer domain registration in order to offer you a complete package. In fact, if you buy a hosting package from Bluehost, they’ll throw in the domain name just for free. • Contract and Pricing: Bluehost is pretty cheap, especially during the first few years. Their basic hosting offer is for $2.75 per month, which includes the free domain name and other interesting perks. However, once the initial period is over, which could be one to three years, depending on what you choose, the price spikes up a bit. • Customer Service: The support team at Bluehost consists of exceptional people who are available for their clients 24/7, all year round. In fact, some people end up going with Bluehost thanks to the support team alone. • Additional services: Seeing as Bluehost is an official WordPress hosting partner, they automatically give you access to all the perks that come with using WordPress as you are building your site. They also offer an SSL certificate, domain privacy, and all the other services web hosting companies offer. In addition to that, they are willing to provide marketing and website design services should you be willing to pay. • User experience: Their platform is pretty easy to use and quite intuitive, which makes all the more sense when you realize that Bluehost is meant to be accessible to a beginner. Just like Bluehost, Hostgator is renowned for hosting websites. As a matter of fact, the company is currently hosting more than nine million websites. Yet, still like Bluehost, they also offer the service of domain name registration. One of the better things about hosting with Hostgator is that the website will rarely go offline; after all, their uptime is 99.99 percent. They offer very low-priced hosting, similar to Bluehost. 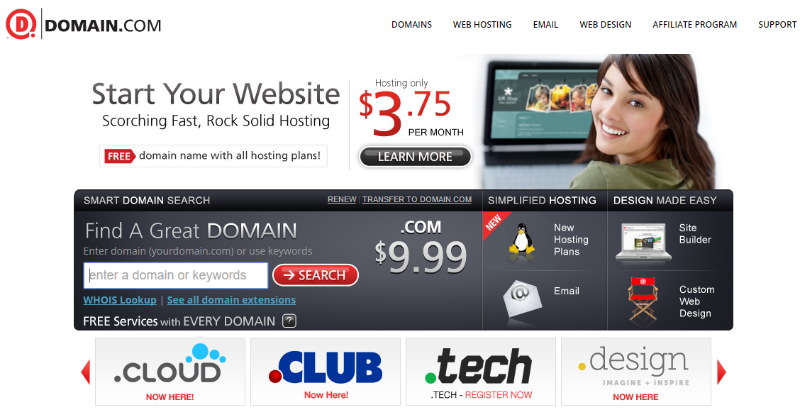 They have a bundle that provides hosting, email, and a free domain name, all for a price of $3 per month. They have domain privacy along with a domain search tool that is simple and intuitive. It is easy to transfer a domain thanks to how beginner friendly their domain management area is and how well documented it is. Be it the domain management area or the DNS management tools, Hostgator offers a user-friendly interface that facilitates the process of building a site. Considerably smaller than GoDaddy, Namecheap has registered approximately 1.3 million domain names, giving them 0.4 percent of the entire market share. Nevertheless, they have been gaining momentum lately thanks to being one of the more trusted registrars out there. The pricing depends on the Top Level Domain (TLD) extension you’re buying. So, if you are purchasing a .com, you’ll have to pay $10.69 for a year. Alternatively, a .net extension will have you paying $12.88 a year, whereas a .org extension costs $12.48 annually. As well as the classic domain extensions, Namecheap offers most country-specific extensions. When setting up your domain, Namecheap can help with their clear and instructive video tutorials. As for the support team, they are a very helpful, responsive bunch, available to you around the clock. However, you can only reach them through live chat, which means you can’t pick up the phone and call them. They offer a free DNS service along with WHOIS protection. Additionally, they have SSL encryption. They also offer a free integrated e-mail account, and any extra e-mail account will cost you $0.25 a month. Furthermore, they are willing to provide you with a hosting plan if you are interested. Namecheap doesn’t try too hard to upsell you stuff that you wouldn’t need. The site is very easy to use, almost intuitive. This goes even more for their domain management pages. In 2009, Hover is a subsidiary Tucows inc., the third largest ICANN accredited registrar. More accurately, Hover came about when three companies operating in the domain registrar space decided to merge. With that said, what makes Hover stand apart from the most of the registrars out there is that it focuses all its energy on one thing only: domain name registration. The company doesn’t concern itself with hosting or anything else, making the interaction with them seamless and easy. Their .com registrations stand at $12.99 a year when you start with them, and then you will have to pay $14.99 when renewing. The fact that they are specialized in domain name registration only makes their customer support of the highest caliber, and if you are experiencing any problems with your domain name, an actual person will help you solve that problem. However, the support is not open 24/7; they have working hours that go from 8 a.m. to 11 p.m. (Eastern Time) during the week, and 8 a.m. to 8 p.m. during the weekend. Hover will give you a Whois Privacy when you start out with them as a bonus. This is free so long as the domain is registered with Hover. Because Hover only works with domain names, they don’t have much to upsell you. Consequently, there aren’t plenty of additional services tacked on as you check out; instead, what you see is what you get. Specialization comes with its benefits, and this is no exception. Hover makes setting up your domain a cinch, and their backend is clean. Seeing as GoDaddy is one of the oldest domain name registrars out there, it should come as no surprise that they are also the largest registrar in the world with around 18 million clients, managing for them around 77 million domain names. Additionally, they are also a hosting company, making them a colossal one-stop shop for anyone who’s looking. Over and above, not only do they offer all the classic extensions you’re used to, but they also have all the main country-specific extensions. Obviously, a company with this size is ICANN accredited. Normally, registering a domain name ending in .com costs $11.99 per year, yet the company has run promos before where they have advertised that you can register a domain a name with them for the meager price of $0.99. Other extensions can come at different costs. For example, a .org extension is worth $7.99 a year. Their phone support is excellent, whereas their chat support gets a passing grade. Along with domain name registration and hosting services, they offer plenty of services that are meant to help larger sites as well as eCommerce platforms. On the other hand, they also have the other services you can find at most other registrars, including Whois Privacy, independent e-mail accounts, SSL certificates, access to a website builder tool, and access to an online store module. This is not to mention that GoDaddy allows you to buy domain names in bulk. As clunky as some of their tools may be, they have a somewhat smooth domain management interface that makes it easy to transfer your domain. Given how big GoDaddy is, the company will try to upsell you constantly, which makes using their platform a bit tedious. Their platform can be a bit messy, but the main problem you’ll face will be the consistent attempts at upselling you, which will become frustrating at some point. Another old registrar on this list, Register.com has been in the domain name registering space since 1994. The company is responsible for overseeing more than 2.2 million domain names, leaving them with a market share of 0.6 percent. Not only are they an ICANN accredited company, but they are also one of the first five companies to be accredited. For a .com domain name, you’ll have to pay $8.88 annually, whereas a .net will cost you $11.41 a year. Moreover, a .org is priced at $10.23. Their customer service team can be reached through phone or e-mail, but they are not available on live chat. Their working hours are from nine to five during the week and from 9 a.m. to 10 p.m. during the weekend. Register.com offers several other services, but each one will cost you. For instance, Whois privacy is for $11 a year, an SSL certificate costs $24 per annum, and domain expiration protection is priced at $10. Additionally, they do offer hosting services, where their standard option starts at $5.95 per month. They do offer domain transfers. Dreamhost was launched in the previous millennium, back in 1997, and, as the name suggests, they offer hosting services, hosting more than 15 million sites and serving north of 400,000 customers. They are also a domain registrar with an almost unlimited supply of domain name extensions. To top it all off, the company is environmentally friendly. In a nutshell, their prices are as follows: A .com extension will cost you $11.95, whereas both a .net and .org extension will cost you $13.95 each. Another old domain registrar on this list, 1 and 1 was established back in 1988. It is a large domain registrar that is responsible for more than 19 million domain names. Additionally, registering with them is incredibly cheap during the first year, a situation that changes when it is time to renew the registration. As with most registrars and web hosts, the prices you get when you first sign up are different than those you get come renewal time. For the first year, a .com extension goes for $0.99, and the same goes for a .org extension. That being said, when it is time to renew, the fee will become $14.99 a year. 1 and 1 have a basic all-in-one web package that includes hosting, WordPress installation, and 100 e-mail accounts. Additionally, they offer you a multitude of services that complement their hosting products. They don’t add on any additional prices, so when they tell you that a service will cost you a certain number, that’s the number they’ll be charging you. Google Domains is a simple domain name registrar from Google that aims at providing the customer with a quick and efficient way of registering a domain name. Ergo, everything about Google Domains is geared towards achieving this efficiency, including getting rid of unnecessary ads and sales banners. However, unlike a registrar such as GoDaddy, Google Domains doesn’t offer some domain extensions. Their prices are pretty much in the same ballpark as most of the registrars here if not a bit above average. For a .com or a .org extension, you’ll have to pay $12. If you’re having a hard time, they have an excellent FAQ that you can browse and learn from. Moreover, you can get in touch with support by live chat, e-mail, or phone any time of the day you like. And, seeing as this is Google, you can expect a level of customer support that is second to none. They’ll offer you a free Whois privacy protection for free, and it’ll stay free so long as you’re registered with them. Google will also make your domain easy to integrate with the best website builders out there. Over and above, they offer you e-mail with GSuite. For the sake of simplicity, upselling is kept to a bare minimum. Furthermore, they don’t offer you any “special” deals, deals that turn out not to save you much in the end. What qualities should you look for when choosing a registrar? It is worth knowing that some registrars out there that aren’t approved by the Internet Corporation for Assigned Names and Number, the ICANN- we talked about them earlier- but are still selling domain names all the same. Ergo, you should stay safe and steer clear away from any domain registrar that isn’t accredited by the one regulatory institution whose job is to approve domain registrars. More often than not, this factor is the first thing that catches your eye and for good reason. Each registrar offers different pricing options along with different time intervals. For example, you can register your domain name for a year or for a period of ten years, depending on what the registrar is selling. Also, different registrars can offer very different prices, where the same name for a site can be priced at $6.88 with one registrar but be priced at $29.99 with another. Over and above, country-specific domain names, such as those ending in .uk in the United Kingdom, will have their own different prices, depending on the local domain registrars in the country. a. It is usually preferable to start out by registering for a year so as to get a feel for the whole process and to avoid overcommitting. b. It is important to look at any associated or hidden costs involved, such as the cost of renewing the registration or the cost of transferring the domain. When it comes to anything tech-related, it is always a good idea to have a company that offers good customer support on your side. After all, it is easy to get confused when dealing with modern technology, and the last thing you want is to waste valuable time trying to figure what went wrong with your registered domain name. Hence, it is always a good idea to read the reviews others write, or, better yet, you can see for yourself how responsive a company is firsthand. In today’s extremely competitive environment where every company is vying for your business, registrars tend to offer several additional services that are meant to attract you, including privacy and security. Moreover, some registrars offer their users additional services that facilitate building a site from scratch, including helping with the hosting as well as with the acquisition of certificates. Therefore, if you’re planning to build a website yourself, you should consider how proficient you are on a technical level as well as how much it would help to have a one-stop shop that gives you everything you need. A case in point is how some registrars are willing to set up your domain name for you, whereas if you did it yourself, you would have to deal with DNS settings and learning how to redirect your domain to your website. Suppose you signed for a certain registrar tomorrow, and a few months later, after having tried their services for a while, you realized that you are not comfortable with their services, prompting you to decide to switch registrars, the question is how feasible is it to transfer your domain name from one domain name registrar to another? Well, the answer depends on whom you signed up with, to begin with. You see, some registrars allow for easy, free transfer with no hassle involved. Alternatively, other registrars prohibit transferring or charge you a fee in order to do it. In either case, it is always a good idea to know a registrar’s transfer policy so as to know what to expect in the future. Moreover, it is never a bad idea to keep your options open. An important question to ask yourself is what would happen if you forgot to renew your domain name registration for any reason? Do you just lose the name? Does it go back on the open market, where anyone, including your competitors, could snag it? Your registrar should have an answer to all of these questions. Ideally, your registrar should shelve your domain name for a certain period of time, yet it should in the very least send you a reminder that it is almost time to renew your registration. Now that we have seen some of the biggest and best registrars out there, let’s wrap up by taking a look at a few pro tips that can make your experience registering a domain name that much better. Although there are many web host providers who also offer you domain name registering services, it is preferable to have a specialized registrar do that for you, especially if you, or whoever is setting up the site, are technically proficient enough to work without having to resort to a one-stop shop. The reason that the pros advise having the domain registration and the web hosting done at two different companies is that it gives you a considerable degree of flexibility you wouldn’t have otherwise, especially if you decide to change your hosting provider at some point. Additionally, a separate set-up is more secure and is more ideal when managing several domain names simultaneously. All that being said, if you are more comfortable with having everything centralized in one place, you should go for it, especially for those of you planning to work on one website only. Even though some registrars offer domain privacy for free, others will sell it to you for a price. In that case, you would do well to buy it. This will protect your personal information and prevent it from becoming publicly available, hence shielding you from spammers and phishers. In order to attract your business, registrars will usually offer you a very cheap price upfront, only to increase the price when it’s time to renew. Because of that, some people like to register a domain name for 10 years, the longest allowed period according to the ICANN, so as to lock in that low price for as long as they can. However, those of you who are still starting out, it is preferable to register for only a year as you still are figuring things out and are unsure whether you will want to continue maintaining your site a few years from now. Some businesses rely heavily on their websites, think Google, and if their website crashes, even for a day, this can be disastrous. Accordingly, such businesses are better off having their domain automatically renewed; otherwise, the best case scenario is that their website crashes for a day, and the worst case scenario is that someone else buys their domain name. As important as picking the right registrar might be, picking the right URL is even more important. In fact, odds are you can buy any available URL you can think of from most of the registrars on this list. However, if you believe that a certain URL is perfect for what you have in mind but the registrar you want to work with can’t register it, you should change registrars rather than changing URLs. This is all the more pertinent for people who want to work with web hosting companies as their selection of URL extensions can be somewhat limited compared to specialized registrars. You probably have noticed but unless a registrar is offering an enticing initial price, the differences in price between different registrars are usually minuscule. However, the real difference can be found in the quality of the customer support or in how user-friendly their platform is to use. Granted, you shouldn’t disregard prices altogether, but you should remember that price is just a small piece of a much larger puzzle and that paying a higher price in return for more peace of mind might not be a bad deal.